Helix is dedicated to making DNA learning accessible and actionable for everyone. Their mission is to empower every person to improve their life through DNA. They believe in a world where everyone benefits from their biological information and is able to help all of humanity lead better lives. The Helix DNA test kit requires a saliva sample. You can use the Helix DNA test kit to learn more about your ancestry, family, fitness, nutrition, health, and entertainment. Order the test kit and send in a saliva sample. Helix reads your DNA using true next-generation sequencing, which unlocks 100x more data that other companies. 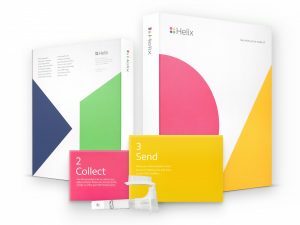 Instead of storing single tests, Helix assembles, stores and protects your genetic data so you can share it with any partner of your choosing without ever having to provide another saliva sample. Through Helix, you can explore a variety of DNA-powered products that help you discover more about yourself and make better-informed decisions about your life. From the profound, to the just-for-fun, there’s a lot to learn about yourself through your DNA. Much of this learning is done via apps that connect with the Helix data. Purchase the Helix DNA kit and use it to send one saliva sample. After that, you can purchase apps and websites that can tell you more about your DNA. You can choose what apps or websites you want. You can learn more about your Ancestry. An app called Insitome Traits (for iPhone or browser) helps you discover which of your unique traits may have been inherited from Neanderthal and Denisovan ancestors. This includes muscle growth, skin color, cognitive ability, and more. National Geographic’s Geno 2.0 Next Generation can show you the migration paths your ancient ancestors followed, and tell you the details of your ancestral makeup. Those who want to start a family can purchase CarrierCheck, and discover their carrier status for 67 inherited conditions. Considering nursing a baby? Breast Milk DHA+ can show you how much DHA is in your breast milk and if your genetics might affect the amount of DHA your baby receives. DNA is an omega-3 fatty acid vital for infant development. Right now, Helix has connections with an Inherited Diabetes Test (from Admera Health) and an Inherited Cholesterol test (also from Admera Health). Helix is in the process of adding more products that use your DNA to tell you about your health.